Draft Day is at its best and most absorbing when it focuses on the deals, politics and inner-league drama that undoubtedly ensue on the day of the NFL draft. In this regard, it’s sharp, rhythmic and convincing, and the characters’ decisions and fates are important to us. But it also pads these better qualities with the contrivances and melodrama of a traditional Hollywood screenplay, which unfortunately slow things down. It’s as if two different movies are duking it out for screen time - one that’s daring, credible and insightful; and another that’s safer and more feel-goody, whose developments we can easily anticipate. In the end, I’m not sure which movie wins out, but because the performances are strong and the characters likable, I opted to give “Draft Day” a marginal pass. As the name implies, the entire film takes place on the day of the 2014 NFL Draft. Over the course of 12 hours, we follow Sonny Weaver Jr. (Kevin Costner), the general manager of the Cleveland Browns, who, like all the NFL’s GMs, has a lot riding on him. It’s his job to pick the most promising young men among the 224 candidates who are graduating from college and hoping to sign NFL contracts. For Sonny, his decisions are also personal. The city of Cleveland, according to the movie anyway, doesn’t have a lot gong for it except its sports teams, and Sonny feels he has an obligation to deliver it a winning franchise after a long losing streak, not least to continue the revered legacy of his father, a former Browns coach who died a week earlier and whom Sonny had the unfortunate task of firing at the request of his mother (Ellen Burstyn). But Sonny isn’t so sure about Bo. His gut tells him to keep an open mind and consider defenseman Vonte Mack (Chadwick Boseman), who’s talented but comes with a chip on his shoulder. There’s also Ray Jennings (Arian Foster), a running back who recently had a run-in with the law but whose father (Terry Crews) is a former Brown. At first, Sonny veers toward the obvious choice of choosing Bo, but at what expense? Not only is he willing to trade his first-round draft picks for the next three seasons, but also, he fears, his integrity. All the pressures and anxiety Sonny feels make it easy for us to identify with him, and it’s not just the issues tied to his job, but also his father’s passing and the sudden news that his girlfriend and co-worker, Ali (Jennifer Garner), is pregnant. He’s also got Coach Penn (Denis Leary) breathing down his neck for not consulting him about every little detail. 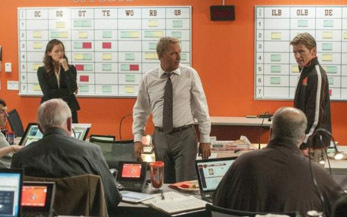 As Sonny’s boss, colleagues and family members relentlessly pursue him for answers and updates, we’re able to recall similar moments from our own lives, and it’s these connections that ultimately make Draft Day work as an entertaining drama. But it’s also intriguing because director Ivan Reitman and screenwriters Scott Rothman and Rajiv Joseph offer us a glimpse into the NFL on one of its most important days of the year, and it’s sometimes fascinating. Even though the specifics of Sonny’s world will be unfamiliar to most viewers (myself included), the dialogue and intonations of the characters ring of truth and we feel like we’ve gotten an actual taste of the high stakes and challenges associated with the organization. But just as it takes us into relatively unexplored territory, Draft Day also settles for generic plot developments and character archetypes. There’s one particularly mawkish scene when Sonny and his staff members watch an old tape of a college football game, which functions solely to generate sympathy for a single character. I was insulted by the way it sunk to such a shameless level simply to tug at our heartstrings. This is followed by other moments that aim to paint certain characters in a darker light than others, all in an attempt to make Sonny’s final decision easier. It’s too bad the movie didn’t stick with its initial theme all throughout - that when it comes to the NFL draft, there are no easy decisions. Perhaps the studio felt they couldn’t sell the movie on being about the NFL draft alone and needed more traditional elements to soften the audience up. But if that’s the case, I think they’re under the false impression that we don’t want to be tossed into a world we haven’t been in before and therefore require standard narrative devices to get us through it. Even so, Draft Day has enough going for it, especially its performances and sharp, intelligent dialogue, that we forgive it its other flaws. Costner falls naturally into his role, as does Leary, and watching the two of them and the other NFL big wigs talk shop proves engaging. If the movie had focused just on these aspects, it would have been a leaner, more satisfying experience. As it is, it feels weighed down by unnecessary melodrama. Fortunately, its goods keep it afloat.